Earth Day is around the corner! I love Earth Day, because our planet is so precious. It’s a great opportunity to teach students about how we can take care of our home while also targeting speech and language skills! 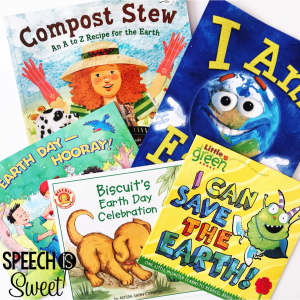 I decided to round up some Earth Day books to help you with lesson planning! – Comprehension – I recommend creating a KWL chart for this book! Activate students’ prior knowledge by first discussing what they already know about the earth and what they want to know. When you’re finished reading, students can discuss what they learned about the Earth! – Describing – Students can work on describing the Earth! – Problem Solving – Students can brainstorm ways to keep the Earth healthy. – Sequencing – This book goes through the steps of planting a seed! – Problem Solving – I think that all Earth Day books are great for working on problem solving! Students can work together to think of little things they can do each day to help the Earth! For instance, Biscuit gets a plastic bottle out of a pond! – Quantitative Concepts – You can talk about which bags have “more” or “less” cans. – Social Skills – The students approach a variety of people around the school for help! For instance, they ask the custodian to set up a barrel in the hallway to collect cans. Asking for help is such a critical social skill! You can discuss ways to approach other people and how to ask for help. – Vocabulary – This a great book to reinforce math vocabulary! It’s also a great introduction to Earth Day vocabulary (recycling, etc). Categories – you can sort items that can be composted vs. items that cannot be composted. Sequencing – Have students create their own recipe for compost stew! Articulation – This is a great book to use to work on /k/! Have your /k/ students create a recipe for compost stew that features all /k/ words (ex. coffee, kitchen scraps, kiwi peel, etc). Actually, you can use this book for any sound! For instance, have your /r/ students create compost stew with /r/ ingredients (ex. rye bread crumbs, rinds, carrot peels, etc). Problem/Solution – Max has a problem and he finds a solution! Cause/Effect – What happened when Max couldn’t watch TV? What happens if we don’t take care of the Earth? This is a fabulous book to work on cause/effect! Adjectives – This book is full of describing words (beautiful, ugly, fresh, etc). Do you have a favorite Earth Day book? Comment below and let me know! « Articulation Therapy: 5 Ideas to Reach 100 Trials!